I named this unique dining room table after Shequaga Falls (She-Qua-Ga) a 156' waterfall that tumbles year round in the heart of the picturesque town of Montour Falls, NY. The table top and feet are made from quarter sawn white oak and the legs are made from quarter sawn red oak. When closed the table measures 48" round and seats four. 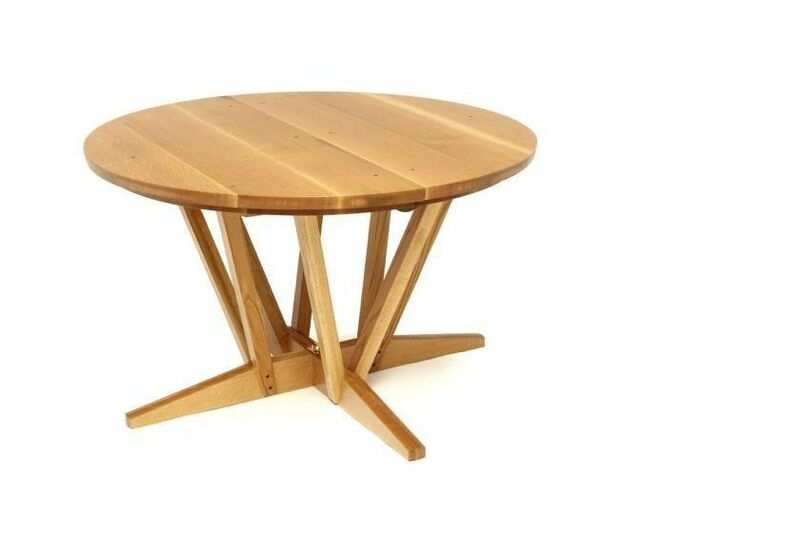 Three additional leaves expand the table to a 72" oval that can accommodate ten adults comfortably. The table features equalizer slides that open in both directions simultaneously— balancing the table's weight evenly. A built in camber counteracts any tendency to sag when fully extended. Brass pins and sockets ensure a perfect alignment of your leaves—while table yolks guarantee a tight joint. The ray fleck pattern of the quarter sawn red and white oak is highlighted by the table's natural lacquered finish.